The St. Ambrose Anglican Church in Redcliff was designated a Provincial Historic Resource in 2008. In order for a site to be designated a Provincial Historic Resource, it must possess province-wide significance for either its history or architecture. To properly assess the historic importance of a resource, a historian crafts a context document that situates a resource within its time and place and compares it to similar resources in other parts of the province. This allows staff to determine the importance of a resource to a particular theme, time, and place. Below is some of the historical information used in the evaluation of the St. Ambrose Anglican Church. When the Canadian Pacific Railway was extending its survey grade across the southern prairies during 1881-82, a point was made to identify places suitable for the erection of stations and the subdivision of townsites. One such spot was where the railway was earmarked to cross the South Saskatchewan River at present dayMedicine Hat. Among the established industries in the area was that of clay products. Common clay and shale were readily available along the river flats, while ball clay, fire clay, and stonewear clay were to be found in the outlying areas. What is the Alberta Register of Historic Places? The Alberta Register of Historic Places is a database listing most historic places designated under the Historical Resources Act. If a site is designated a Provincial Historic Resource, a Registered Historic Resource or a Municipal Historic Resource it is likely included in the Register. 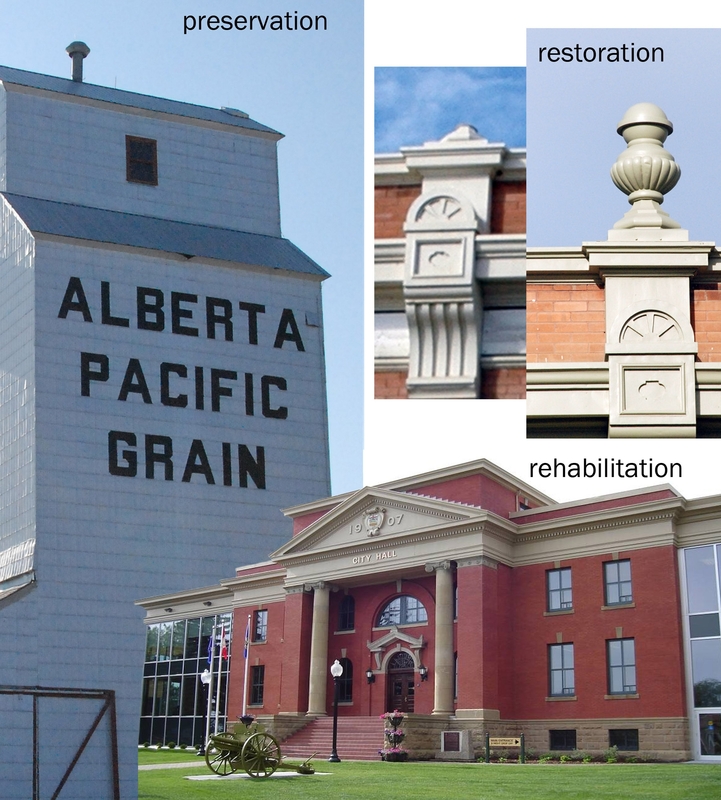 The Alberta Register of Historic Places is administered through Alberta’s Historic Places Designation Program. This program is responsible for identifying, evaluating and designating Provincial Historic Resources, updating and maintaining the Alberta Register of Historic Places, and submitting eligible sites to the Canadian Register of Historic Places. Sites listed on the Alberta Register of Historic Places are eligible for listing on the Canadian Register of Historic Places; a national database listing formally recognized historic places from all across Canada. Visit the Canadian Register and explore from “coast to coast to coast” the varied historic places of local, provincial, territorial and national significance. A previously unnamed creek in the Bow Valley near Canmore has recently been named Bill Griffiths Creek. The name commemorates William “Bill” Griffiths. The spring-fed creek rises just east of the TransCanada Highwayand just south of the town of Canmore. It flows south-easterly, generally parallel to the Canadian pacific Railway tracks, for approximately four kilometres before joining the BowRiver about three kilometres upstream from the hamlet of Deadman’s Flats. Bill Griffiths was a fisheries biologist with Alberta Fish and Wildlife. He received a Bachelor’s degree from the Universityof Alberta and a Masters degree from the University of Canterbury in New Zealand. He worked for Alberta Fish and Wildlife briefly in 1976 and again from 1979 to 1983, this time as the Regional Fisheries Biologist based in Calgary. In this position he initiated new fisheries management strategies and regulations aimed at enhancing the Bow River’s trout fishery. He also did freelance consulting work in Burundi, Africa from 1983 to 1984, after which he returned to Alberta as an Environmental Assessment Biologist with Alberta Environment. In 1985, he returned to Fish and Wildlife where he coordinated volunteer efforts to establish fisheries habitat enhancement programs. In 1987, he completed two major enhancement projects; one at Gap Lake in conjunction with the Sarcee Fish and Game Club and the other on a small creek near Canmore with the cooperation of the Upper Bow Valley Fish and Game Club. This second creek, which is the one that now bears his name, is now considered to be one of the most important spawning areas for brown trout in the BowRiver watershed. Due largely to his efforts, the Bow River has become recognized as a world-class trout fishery by scientists, writers and anglers. Bill Griffiths died in 1988 and this creek has been locally known as “Bill Griffiths Creek” since that time. This name, now made official, commemorates his commitment to developing the brown trout fishery in the Bow River and his connection to this creek, which has become the subject of many studies and reports. The naming proposal was made by former colleagues and students of Bill Griffiths. Local support was indicated by a petition. The Municipal District of Big Horn, the Town of Canmore and the management of the Kananaskis Country Provincial Parks all supported the proposed name. The Alberta Historical Resources Foundation approved the name during its November 27, 2010 meeting and the Minister of Culture and Community Spirit concurred with the decision on February 23, 2011. Notice of the decision was published in Alberta Gazette on April 15, 2011. Description: Flows south-easterly into the Bow River, approximately 3 km south east of Canmore and 75 km west ofCalgary. The final segment of this series ends with the middle – the letter ‘M’. ‘M’ is the most important letter in the heritage conservationist’s alphabet. Maintenance is the best (and cheapest) way to maintain a historic place, and minimal intervention is always the desire when completing an intervention. Maintenance: Routine, cyclical, nondestructive actions necessary to slow the deterioration of an historic place. It entails periodic inspection; routine, cyclical, non-destructive cleaning; minor repair and refinishing operations; replacement of damaged or deteriorated materials that are impractical to save. Minimal intervention: The approach that allows functional goals to be met with the least physical intervention. 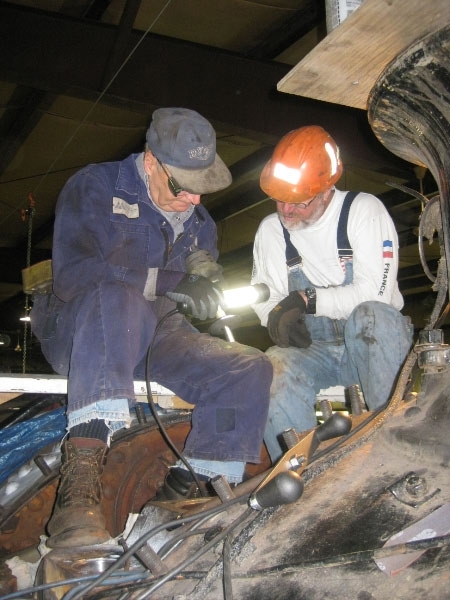 In the above photo Larry G. Potter and Don Totten conduct routine maintenance on the Canadian National Railways Steam Locomotive 6060 Provincial Historic Resource. Click here to read the Locamotive’s Statement of Significance on the Alberta Register of Historic Places. To learn more about the above terms or to read about additional conservation terms, please review the Standards and Guidelines for the Conservation of Historic Places in Canada. The Glossary section of the Municipal Heritage Partnership Program website is also a great resource. Did we miss something? Would you like us to discuss a term not mentioned in this series? Do you want more information on one of the terms we have defined? Submit a comment to this blog post and we will prepare a response. Written by: Brenda Manweiler, Municipal Heritage Services Officer (with definitions from the Standards and Guidelines). Most of the first Japanese to reach Alberta were contract or temporary workers on railway and irrigation projects. Others worked in the sugar beet fields near Raymond. By 1906, however, a few Japanese had settled permanently in Alberta. 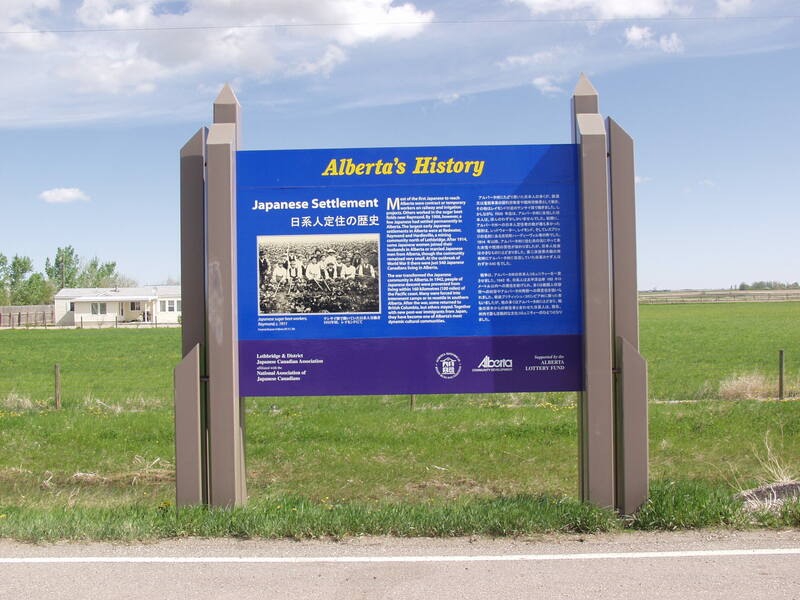 The largest early Japanese settlements in Alberta were at Redwater, Raymond and Hardieville, a mining community north of Lethbridge. After 1914, some Japanese women joined their husbands in Alberta, though the community remained very small. At the outbreak of World War II there were just 540 Japanese Canadians living in Alberta. The war transformed the Japanese community in Alberta. In 1942, people of Japanese descent were prevented from living within 160 kilometers (100 miles) of the Pacific coast. Many were forced into internment camps or to resettle in southern Alberta. After the war, some returned to British Columbia, but others stayed. Together with new post-war immigrants from Japan, they have become one of Alberta’s most dynamic cultural communities. This heritage marker is located west of Raymond on the north side of Highway 52, 1.1km west of Highway 844. If visiting Raymond you might like to also check out the Raymond Buddhist Church. It is a Provincial Historic Resource listed on the Alberta Register of Historic Places. If Part 1 left you confused but less bemused hopefully the terms below will continue to explain the difference between some of our key terms. The Standards and Guidelines for the Conservation of Historic Places in Canada provides direction on how to conserve historic places. But what exactly is conservation and how does it differ from all the other “–tion” words related to historic places? Intervention: Any action, other than demolition or destruction, that results in a physical change to an element of a historic place. Conservation: All actions or processes that are aimed at safeguarding the character-defining elements of a historic place so as to retain its heritage value and extend its physical life. This may involve “Preservation,” “Rehabilitation,” “Restoration,” or a combination of these actions or processes. Preservation: The action or process of protecting, maintaining, and/or stabilizing the existing materials, form, and integrity of a historic place or of an individual component, while protecting its heritage value. Rehabilitation: The action or process of making possible a continuing or compatible contemporary use of a historic place or an individual component, while protecting its heritage value. Restoration: The action or process of accurately revealing, recovering or representing the state of a historic place or of an individual component, as it appeared at a particular period in its history, while protecting its heritage value. The Town of Drumheller spans the banks of the Red Deer River north-east of Calgary in the Canadian Badlands. You probably know Drumheller as the home of the Royal Tyrrell Museum, but it should be famous for more than fossils. Like all of Alberta’s communities, places throughout Drumheller reflect its unique history. In Drumheller these places show us Drumheller’s evolution from a ranching town to a regional service centre and as the site of over 130 coal mines. The Municipal Heritage Partnership Program (MHPP) recently trained the Drumheller Heritage Steering Committee appointed by Town Council. This is the first step MHPP takes when helping a municipality evaluate local historic places. Over the next several months, the committee will develop a context paper defining the people, groups and events that Drumheller feels contributed to its development. The next step will be to identify sites in Drumheller that reflect these influences. Hopefully, many of these sites will have “heritage integrity”—that is, the sites must have enough historic material to reflect the reasons why they are important to Drumheller. If they do, a Statement of Significance will be written for each site. The Statement of Significance explains why the site is valued and what about it must be conserved for it to remain historic. The statements will help Drumheller decide how best to preserve locally significant historic places. 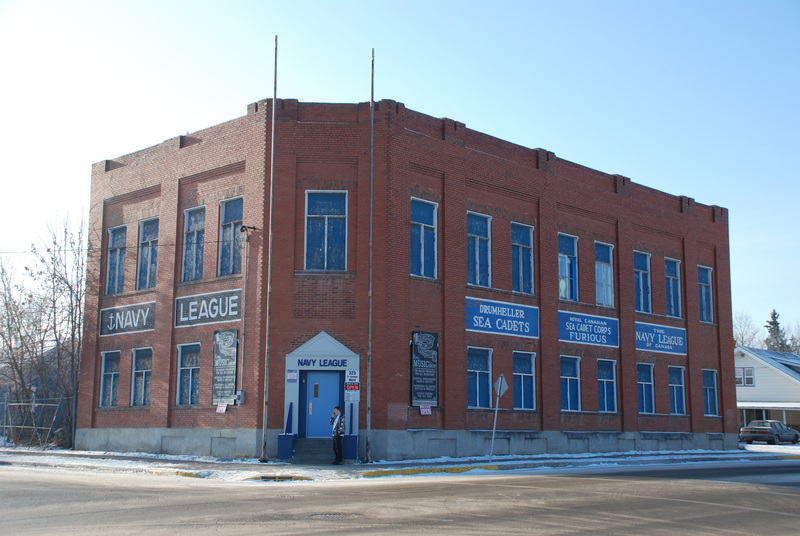 The Navy League building may be one of the sites evaluated in the Town of Drumheller's Municipal Heritage Inventory project. If you would like to learn more about conducting a Municipal Heritage Inventory, please read the Evaluating Historic Places manual found on the MHPP website. If you would like to discuss options please contact MHPP staff.